Trading Away Migrant Rights: HOw The TPP Would Fuel Displacement And Fail Migrant Workers, a report from AFL-CIO "The TPP is a recipe for destabilizing communities, perpetuating low wages and stifling labor rights—all of which are factors driving migration." Report from the Canadian Certre for Policy Alternatives concludes that "the TPP simply reproduces an ineffective rights regime [from past "free" trade agreements} while further expanding a free trade model that has perpetuated labour rights violations in many countries. a report from the Canadian Centre for Policy Alternatives (June 2016) concluding "that expanding and enshrining such investor privileges carries major risks for vot­ers and taxpayers in all TPP countries, with no compelling evidence of a corresponding benefit for the public." Trading Down: Unemployment Inequality and Other Risks of the Trans-Pacific Partnership Agreement. Report from the Global Development and Environment Institute at TUFTS University. Executive Summary: "Proponents of the Trans-Pacific Partnership agreement (TPP), the trade and investment treaty recently agreed by the United States and eleven Pacific Rim nations, emphasize the prospective economic benefits, with economic growth increasing due to rising trade and investment. Widely cited projections suggest GDP gains for all countries after ten years, varying from less than half a percentage point in the United States to 13 percent in Vietnam." care in the face of new challenges. The Trans-Pacific Partnership, Corporations Before People And Democracy A report by the Haas Institute for a Fair and inclusive Society. The TPP’s nuanced provisions will give corporations the power to evade environmental regulations, bypass national courts and override governments, and control workers’ movements throughout the TPP countries. 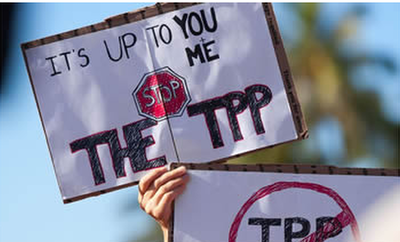 The TPP would threaten key democratic principles in the United States and around the world. 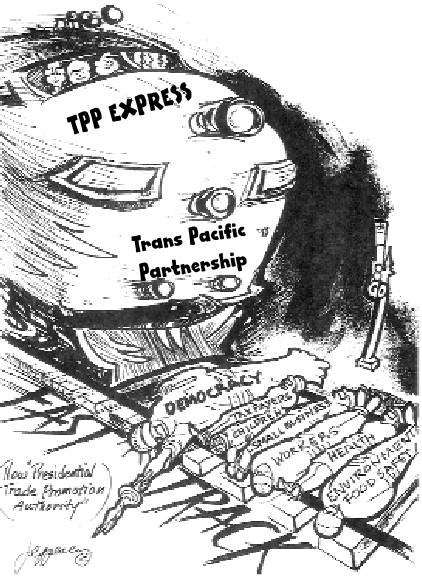 web page on the Trans Pacific Partnership Click here. US Exports Down, Imports from Korea Up and Job-Killing Trade Deficit With Korea Balloons 84 Percent on Third Anniversary of Korea Pact, Which Is TPP Template. These agreement do not create quality job opportunities or increase wages. NAFTA at 20, the New Spin. Report from Foreign Policy in Focus, Institute for Policy Studies. From the report, "The arguments developed prior to the signing of NAFTA focused primarily on the claim that the trade agreement would make Mexico a nation of producers and exporters. These initial promises failed to deliver." NAFTA at 20 - report from Public Citizen on the record of the North American Free Trade Area - jobs lost, instability, inequality, corporate attacks on environmental and health laws. Read the report here. NAFTA, 20 Years of Costs to Communities and the Environment - report by Sierra Club, The Council of Canadians, RMALC, Institute of Policy Studies and Sierra Club Canada. Read the report here. 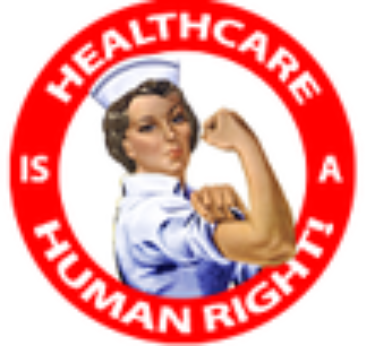 "Today in Central America, life-saving medicines are more expensive due to monopoly protections that CAFTA gave to pharmaceutical corporations – protections that are slated for expansion in the TPP. And the headlines from several CAFTA countries do not report economic prosperity, but economic instability, drug violence and forced migration. Meanwhile, CAFTA’s labor provisions have failed to halt the assassination of dozens of Central American union workers who were trying to end unmitigated labor abuses like wage theft. 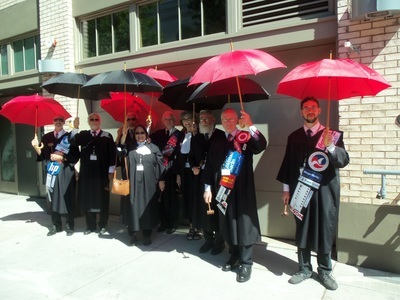 In contrast, the pact’s foreign investor privileges, which the TPP would expand, have succeeded in empowering multinational corporations to challenge domestic laws, including consumer and environmental protections." Read the full report from Public Citizen. . The last two decades have witnessed the silent rise of a powerful international investment regime that has ensnared hundreds of countries and put corporate profit before human rights and the environment.